This is a terminally obscure disc but deep soul enthusiasts will lap it up so high is the quality of the music. 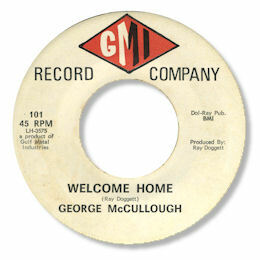 Welcome Home is structured in the grand manner - 12/8 tempo, an organ holding the background together, some tasteful guitar licks, a gently cooing chorus and a big fat horn section - what more could anyone want? George himself has a strong baritone voice with some spot on timing and just enough gospel flourishes to keep it interesting. Love it when he cuts loose towards the end as the horns climb up relentlessly. Sheer joy! The GMI label stands for "Gulf Metal Industries" and as producer Ray Doggett spent a lot of time in Houston during the 60s it's a pretty good bet this was recorded there. Doggett was a country singer and guitarist so it may well be his own playing that we are listening to here.